Port Henry's "Great American Road"
Port Henry has long been at a crossroads of American history and travel. For this reason our village is recognized as part of the "Lakes to Locks Passage", a 225 mile scenic byway that links the Upper Hudson River with Lake George, Lake Champlain and the Richelieu River in Quebec. 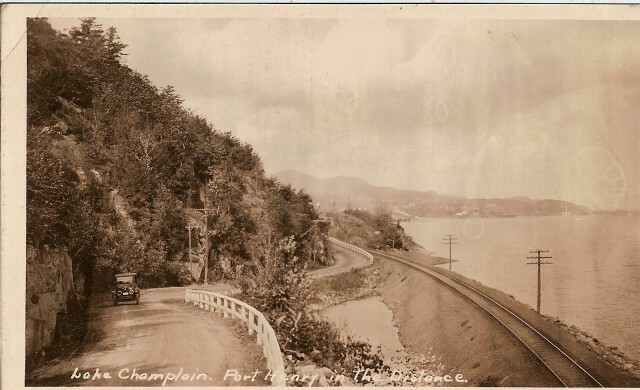 "Port Henry clings to the hillsides that made it rich. A lakeshore bed of iron ore put this town on the map before the American Revolution, and provided ore for the fittings on the fleet of ships built by Benedict Arnold to oppose the British in the Battle of Valcour in October1776. After the wars, a furnace on the lakeshore stimulated the growth of the port. Rich deposits in the mountains to the west fed another furnace that fueled the town's economy for almost a century and changed the contours of the shoreline. Campers spend their summers on beaches created by the iron industry. Port Henry's Main Street proudly announces what iron money could buy." The website goes on to describe our beautiful lake views and such attractions as the Iron Center, our two marinas, and the Moriah Golf Course. Heritage and scenic tourism are one of the driving ideas behind the National Scenic Byways program, founded in 1992. When communities work together, they can create a series of learning and recreational experiences for families taking a driving vacation. Of the roughly 150 Byways across the country, the Lakes to Locks Passage is among the "cream of the crop" in also being designated an "All American Road." In the future, we can do more to draw tourists to Port Henry on our historic Byway. Improving directional signs for the Iron Center, Witherbee Park, and the marinas is one place to start. The revitalization of our Information Booth, now being discussed, is another opportunity. It would be great for the many bike riders (both motorized and pedal) who come through here to have a place to stop for a coffee or lemonade and to learn about our history though brochures and talking with a volunteer. Port Henry and Moriah have a proud place in New York and American history. We can take advantage of our Byway location to share it with more people who will, quite likely, want to come back.